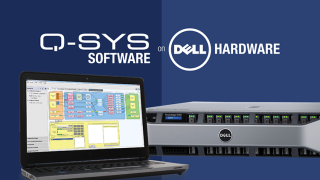 At ISE 2017, QSC will demonstrate its existing, fourth-generation Q-SYS software on a high-performance standard Dell EMC PowerEdge R730 server. This demonstration was conceived as a glimpse into the future of the market where larger installations use centralized data center processing. The demonstrations will take place on February 7-10 at stand 7-Q170. The Q-SYS Platform is centered on audio, video and control (AVC) solutions that take advantage of existing IT hardware, protocols, and standards. The Q-SYS Platform uses standard Intel processing, Linux operating system services and IEEE networking protocols. The technology demonstrated at ISE is the next evolution of this design paradigm, decoupling existing Q-SYS software from proprietary hardware and creating an architecture where centralized AVC processing can live in the data center. Now processing intensive features such as AEC and feedback suppression can become a shared resource for any meeting room across the enterprise. This, combined with a portfolio of cost-effective meeting room I/O peripherals, allows users to reliably distribute content and control using existing IT network infrastructure. Moving to standard mainstream server hardware reflects a typical enterprise IT environment and provides several benefits, particularly for corporate environments and global enterprises, including simplicity and familiarity, following established server deployment, maintenance, and management best practices; centralized resourcing, for easier room resource moves, adds, and changes, and automation of on-demand deployment of DSP-intensive features such as AEC; flexibility to more effectively support centralized, distributed, or hybrid system configurations, and enable current and future software and service deployment models; and reliability, through redundant power supplies, networking, storage, and processing as well as standard Dell BIOS level features including Dell Remote Access Controller (DRAC). “We expect these kinds of systems to become the norm for corporate and larger-scale enterprise installations in the future,” said TJ Adams, director of installed systems product marketing. “By running the existing, field-hardened Q-SYS software on a standard Dell EMC server, users have full backwards compatibility and can expand capabilities of their system by merely adding flexible and inexpensive I/O meeting room end points, such as the recently announced I/O-8 Flex Channel Expander. If localized processing is required in the meeting room, our range of medium-sized to smaller Unified and Integrated Cores, including the new Q-SYS Core 510i processor, fit seamlessly into the design. Per recent product announcements, QSC will continue to develop the Q-SYS Platform to provide standards-based, in-room solutions that are flexible and simple to deploy and manage, including PTZ-IP conference cameras, lower channel-count Core processors, I/O peripherals, bridges, and streaming hardware.